André, Love Graffiti: Annabelle (2011). 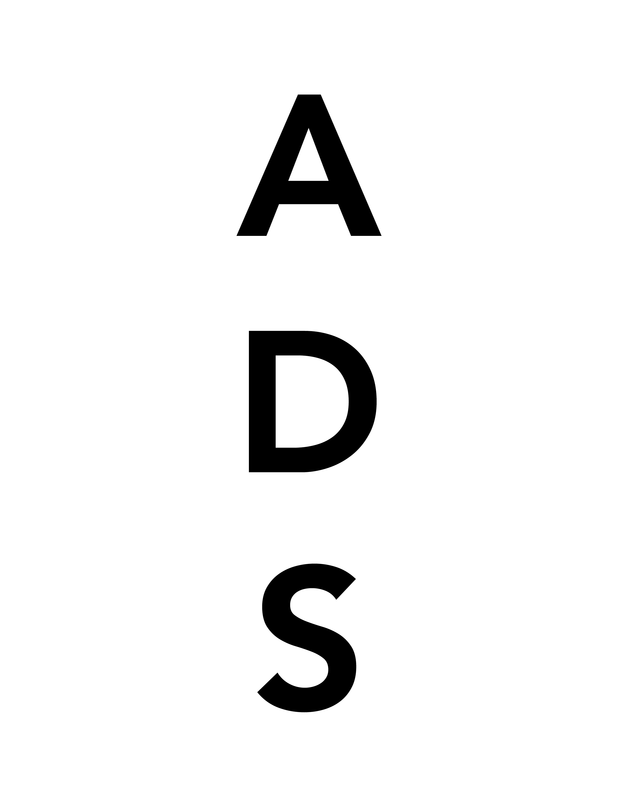 All images by S. Zabrodski for Art Observed, unless otherwise stated. MOCA’s exhibition, ‘Art in the Streets’ has proven to be a hugely popular, if not highly contentious, addition to L.A.’s summer arts scene. 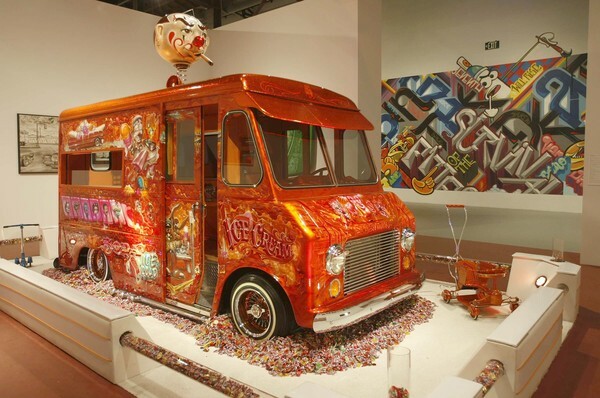 Located at MOCA’s Geffen Contemporary in Los Angeles’s Little Tokyo, the massive space includes the work of around 50 artists in a range of media including murals, photography, installations, graffitied vehicles, and re-created cityscapes. 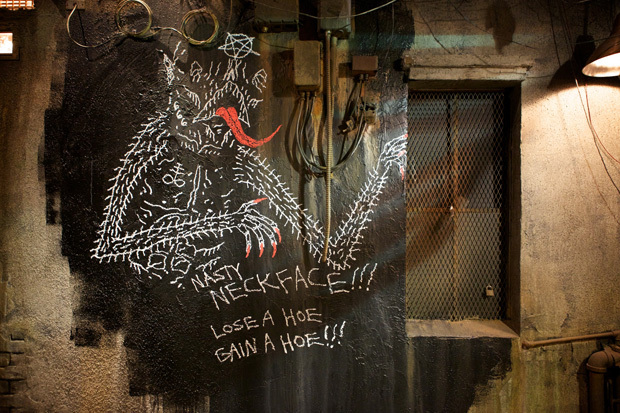 The show has come under fire for its glorification of what many perceive as vandalism. Indeed, the area surrounding Geffen Contemporary saw a spike in graffiti following the opening of ‘Art in the Streets’ in mid-April. As with any survey show, there have been many objections relating to both the inclusion and exclusion of certain artists. 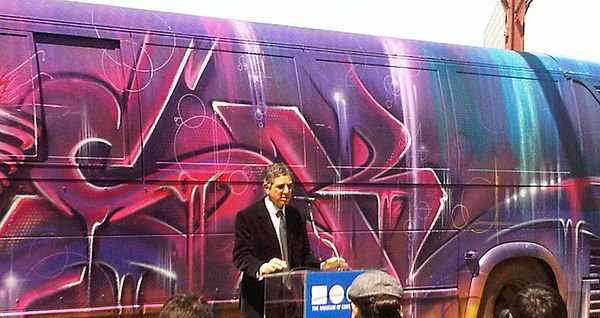 Even before the opening, MOCA Director, Jeffrey Deitch, drew criticism for the museum’s censorship of Italian street artist Blu’s mural depicting coffins covered with dollar bills. The mural was painted over after Deitch deemed it insensitive given its location near a veteran’s memorial. Both in spite of and because of these debates, the show has sparked a discourse that is significant for both artists and audience- since the show has opened, Banksy, one of the artists included in the exhibit, has begun sponsoring free admission on Mondays to pull in even more viewers to an already record-breaking show. Bansky is quoted as saying, “I don’t think you should have to pay to look at graffiti. You should only pay if you want to get rid of it.” The exhibition was slated to travel to the Brooklyn Museum in 2012, but was recently cancelled due to financial constraints. 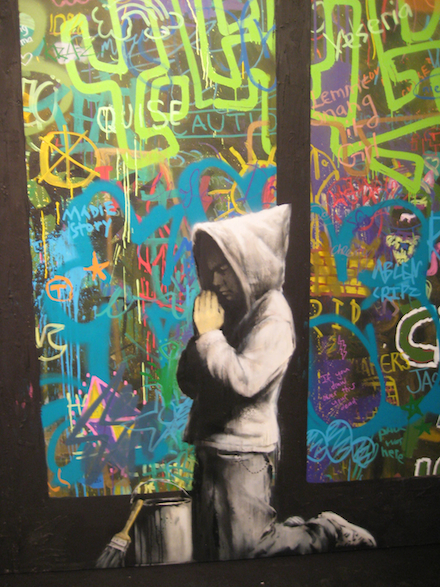 Street art has been making its way into the mainstream in recent years, in large part due to the visibility and notoriety of Shepard Fairey’s Obama poster, Hope, and the success of the Banksy directed film, “Exit through the Gift Shop”. 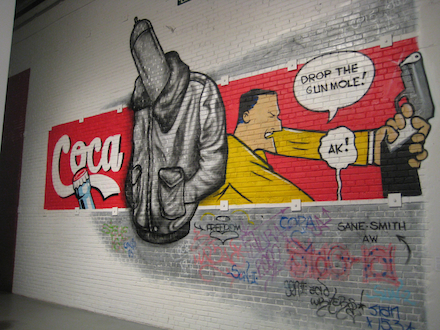 ‘Art in the Streets’ is by no means the first museum show to deal with street artists. 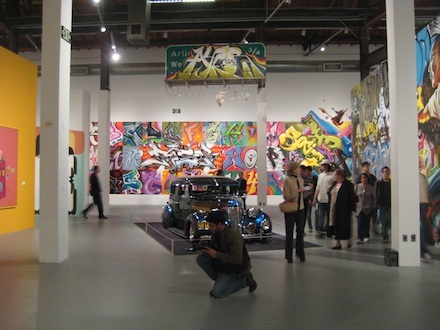 In 2010, the Museum of Contemporary Art San Diego mounted ‘Viva La Revolución: A Dialogue with the Urban Landscape” and in 2008 ‘Street Art’ exhibited at the Tate Modern. 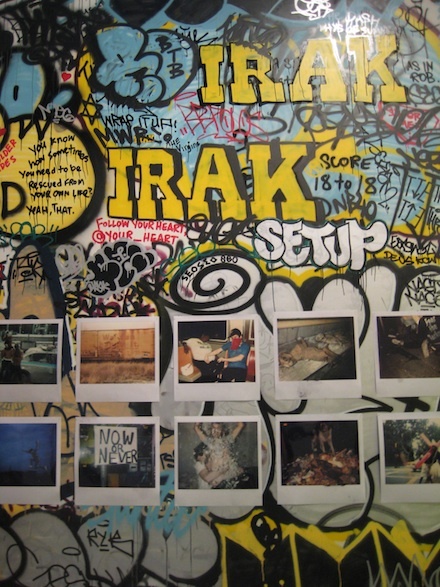 Both of these shows had a more contemporary focus, as compared with the MOCA exhibition which takes a retrospective approach: various wall panels feature a timeline of street art, and highlight important moments from the past few decades, from the 1989 Slick/Hex Battle to the launch of Juxtapoz Magazine in 1994. Unlike many museum shows, which feature a linear progression and clear navigation route through the exhibition, ‘Art in the Streets’ is more fluid. The space is divided into various sections, each of which is associated with a different artist. This floor plan allows for smaller exhibition spaces within the exhibition itself, immersive shows unto themselves. 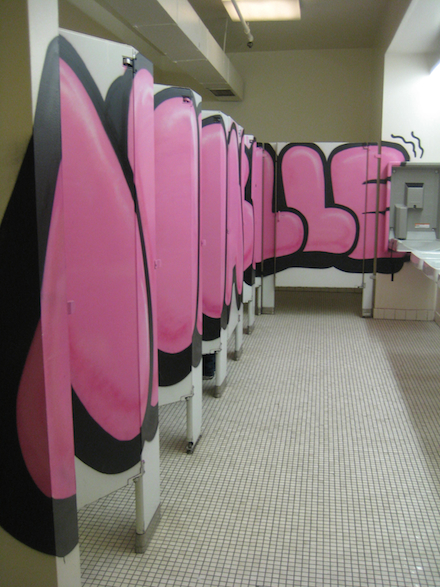 Not even the restrooms are left untouched, as the stalls (both inside and out) are covered by bubble letters and iconic figures of André the Giant by Shepard Fairey. 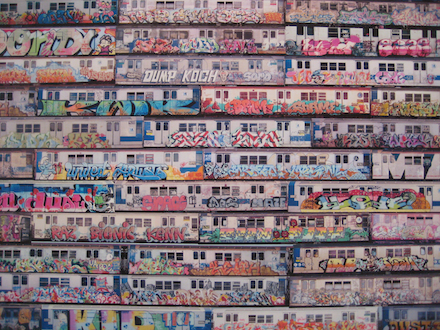 One of the highlights of the exhibitions is, Street, a scaled down cityscape with multiple alleyways, abandoned stores, bright billboards, and decrepit spaces. 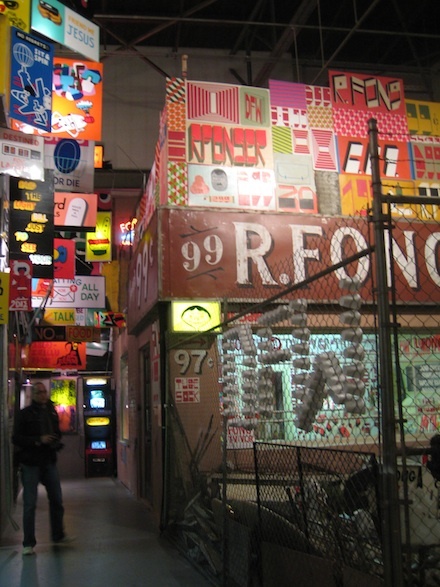 It was created by Todd James, Barry McGee, Stephen Powers, Devin Flynn, Josh Lazcano, Dan Murphy, and Alexis Ros, and is an updated version of Street Market shown at the Deitch Projects in 2000. 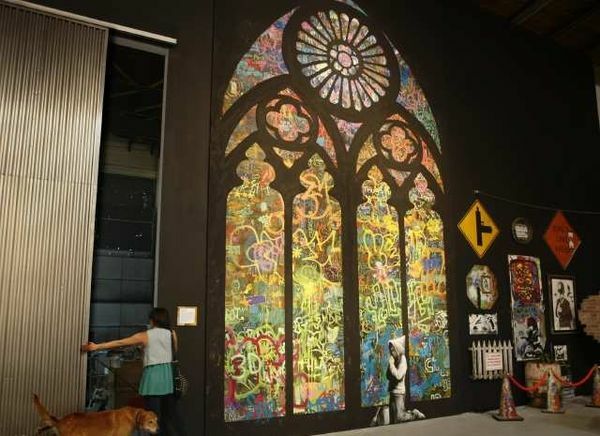 The installation is dotted with animatronic graffiti artists engaged in their craft. An arm reaches out of a small tree, spray paint can in hand, and tags the concrete wall opposite him. Elsewhere, a hoodie-clad figure spray paints hard-to-reach areas by sitting a top another’s shoulders. 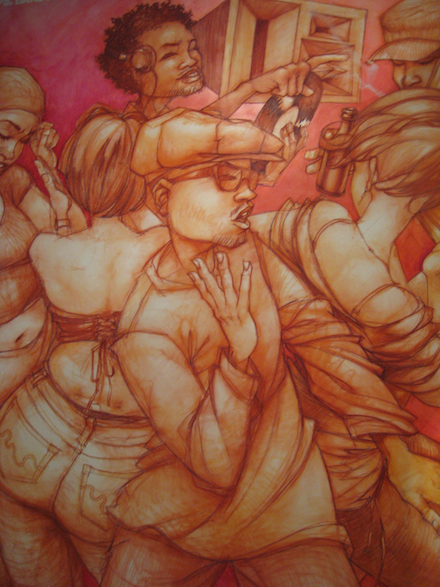 The faces remain in shadow and hidden from view, in keeping with the anonymity required of artists making illicit work. Although the animatronics may feel somewhat kitschy, the overall complexity and level of detail make Street an exceptionally engaging installation. 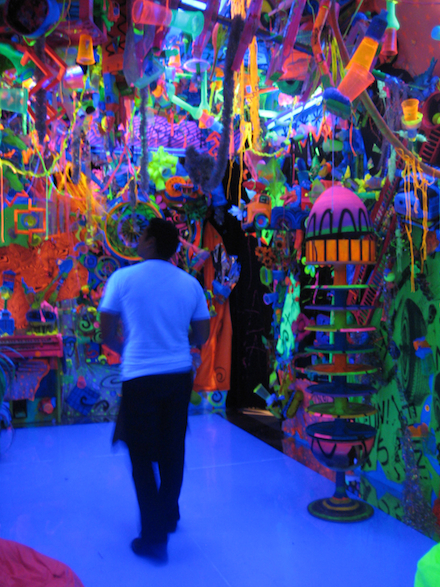 Kenny Scharf’s Cosmic Cavern Closet (FUN) is another re-creation of an earlier installation. Behind a black curtain resides a small room bathed in black lights and featuring a dizzying array of glowing neon objects. Music plays, fans blow, and toys whir and whizz in every direction. Founded by Patti Astor and Bill Stelling, FUN Gallery (1981-1985) was an Lower East Side space which showed radical underground artists such as (the know well known) Jean-Michel Basquiat and Keith Haring. Many of the objects were included in Scharf’s original iteration, Closet #3, which took place at FUN Gallery in 1982. Yet another curtained doorway, this one easier to miss, leads into Swoon’s The Ice Queen (top of article). The teepee-like space is filled to top with the larger-than-life Ice Queen figures, from which light spills forth and casts dramatic shadows. Ice Queen took a month to construct, a fact evidenced by the multitude of elaborate paper cut-outs that evoke hand crafted paper snowflakes. Swoon’s grandmother, whose nickname is “The Ice Queen” was the inspiration for the work. One challenge of creating a survey of street art is the relative impermanence of the original works. Murals have been painted over and destroyed, and photographic documentation is oftentimes lacking or nonexistent. The Self-Portrait created by FREEDOM (Chris Pape) was created on site and based on two of his murals (Self-Portrait from 1984 and Buy American from 1995) located in New York City’s Freedom Tunnel which runs under Riverside Park. Only eight of FREEDOM’s sixty-four paintings still remain. While many street paintings are destroyed within hours or days of their creation, Buy American enjoyed several years of exposure until it was recently painted over by Amtrack. The exterior of Geffen Contemporary is also a site for multiple interventions and murals. 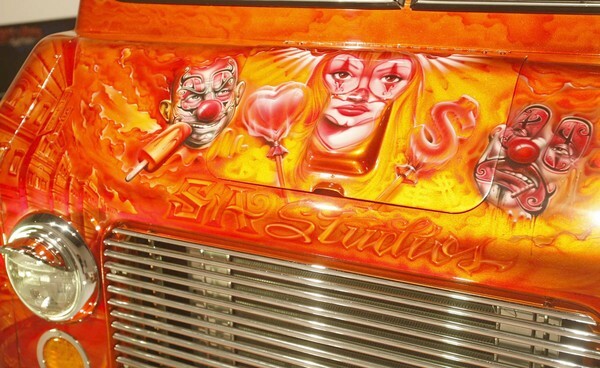 Featuring everything from a Banksy Steamroller to a bus bedecked with graffiti (the destination is listed as “Mad World”) the outdoor setting is perhaps a more authentic location for street art. Regardless of where one falls on the vandalism vs. art spectrum, ‘Art in the Streets’ is a show with immense depth and variety. The Levi’s Film Workshop Collaborative Film Project has been an integral part of the exhibition. 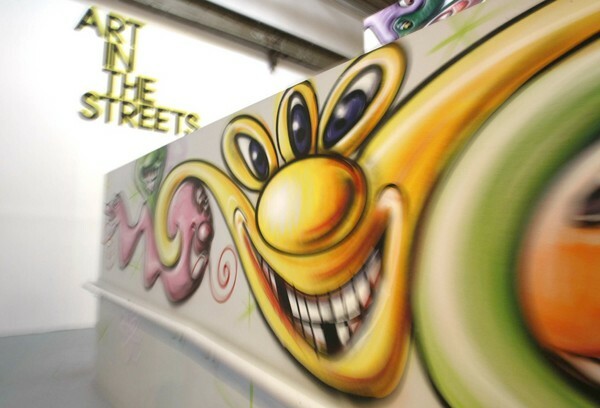 “Art in the streets” partnered with Levi’s to bring facilities and resources to the exhibit that tap into the creative energies of the local community. Trained staff are on site to help people edit their films on Final Cut pro and to transfer old Super 8 films onto DVD, as well as to help with other filmmaking equipment and projects. Many of the artists featured in the show have collaborated with the project, and Levi’s have created educational workshops with special guests from various areas including street art, skateboarding, food and music who share their knowledge on a variety of subjects, such as direction animation and stunts.This is the third in a series of workshops created by Levi’s, the other two were stationed in New York and San Francisco. The projects aim to bring together members of the local community by giving them the professional resources that enables them to share their creative ventures with each other. “Outside In”, a 30 minute introspective documentary about the making of “Art in the Streets” is another of The Levi’s Film Workshop’s initiatives. Directed by Alex Stapleton, the short film includes behind the scenes clips of how the exhibition was constructed, as well as interviews with many of the artists including Shepard Fairey, Swoon, Neckface, Geoff McFetridge, Revok and Invader. Stalpleton and her crew spent around three weeks filming the artists as they prepared for the opening of the exhibition at MOCA’s Geffen Contemporary. As well as highlighting the artist’s creative processes, the film gives a look into the legal issues faced by many street artists. Invader and Revok, graffiti artists featured in the exhibition were both arrested around the time of the opening; Invader was released and returned to his native France, however Revok was sentenced to 180 days in jail after the judge discovered him violating his probation from a previous vandalism conviction. Jeffrey Deitch has plans to put the documentary on the museum’s website and on YouTube, to increase the scope of the show and for the featured artists to gain higher recognition. 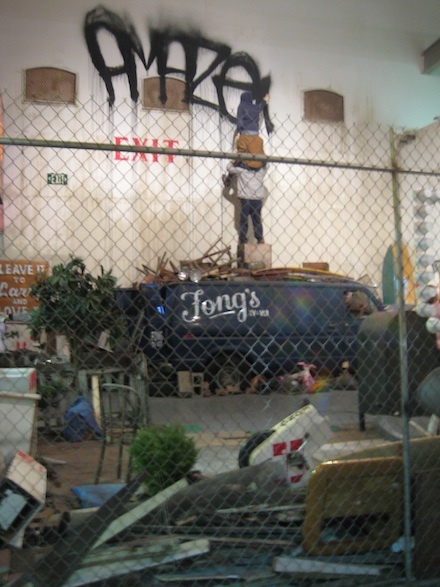 The contention surrounding this exhibition, including the arrest of Invader and the removal of Blu’s mural reflects the larger issues that LA is facing with vandalism. At the start of March, the city of LA launched a program that uses smart phones to track and arrest graffiti vandals. 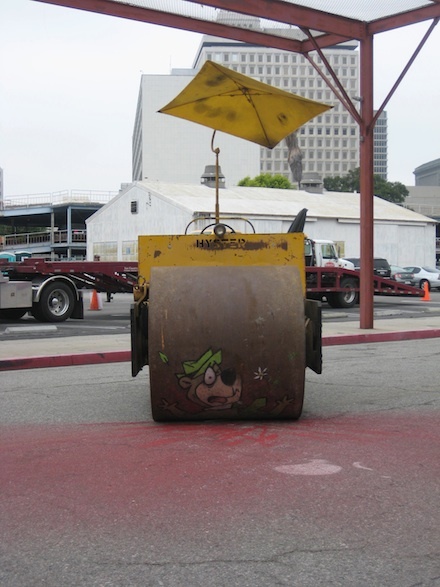 The Tracking and Automated Graffiti Removal System (TAGRS), enables graffiti-cleaning crews to take pictures of graffiti and upload them to a LAPD database, in order to gather evidence and prosecute the supposed offenders. 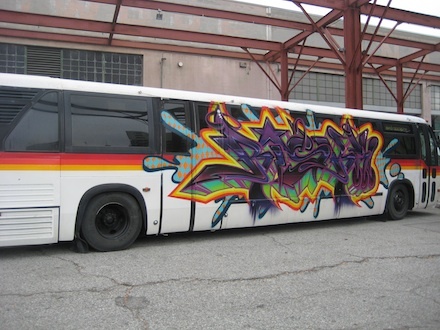 Los Angeles is said to spend about $10 million a year cleaning up graffiti. With works works but artists such as Banksy not only being sold for over hundreds of thousands of dollars, but also drawing on pertinent political and cultural issues, the question has to be begged as to whether graffiti art should be scorned upon in such a way. This entry was posted on Thursday, July 21st, 2011 at 4:20 pm	and is filed under Go See. You can follow any responses to this entry through the RSS 2.0 feed. You can leave a response, or trackback from your own site.